What do I do with my succulent now? 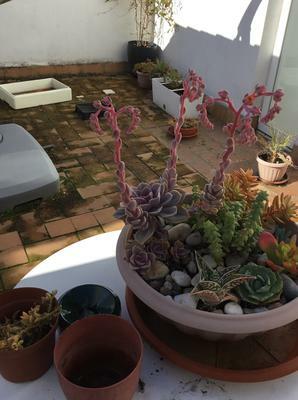 Hi, I live in Seville, Spain and have been addicted to succulents for about 7 years. This plant has up to now produced 11 flower spikes!! I didn't know it was possible. The plant is growing taller, losing lower leaves and has babies at the base. They are always outside on the roof-terrace and get full light all day.When it's really hot I move them to partial shade so they get full sun only in the morning when it's bearable. I don't know what to do now. Will the main plant die soon? Should I cut it off - it still looks very healthy. Comments for What do I do with my succulent now? This is some kind of Echeveria. The fact that it's got that many flowers is an indication that it's completely happy and you shouldn't change a thing - don't cut it off until it's finished flowering. The growth you describe is typical of Echeveria. In time, they'll keep growing upwards and eventually look kind of like a palm tree, with a long bare stalk and a rosette on top. This is totally normal. When it finishes the bloom cycle and all the flowers have faded, cut the flower stalks off right at the base. Then you may want to behead the rosette. The babies at the base can be left to get bigger, or cut off and planted separately. Keep in mind that if you cut it off it may not bloom so prolifically, which is why I encourage you to enjoy it while it lasts. See more about succulent plant propagation here.